Philippine President Rodrigo Duterte talks with Indonesia's Foreign Minister Retno Marsudi during her courtesy call by foreign ministers of the 50th ASEAN Foreign Ministers' Meeting in Manila, Philippines Tuesday, Aug.8, 2017. Southeast Asia’s two biggest countries, the Philippines and Indonesia, are joining forces to stop Islamic State sympathizers from crossing a porous sea border and helping violent rebel groups in deadly battles against the government in Manila. Indonesian Foreign Minister Retno Marsudi met Philippine President Rodrigo Duterte in the southern city of Davao recently for talks that focused on stopping the threat. Duterte and the Indonesian foreign minister agreed to "elevate cooperation" on "maritime security" and "eradicating terrorism," the presidential office website in Manila said. Predominantly Muslim Indonesia is known to have sleeper cells of sympathizers of Islamic State, a world terrorism sponsor based in Iraq and Syria. In 2016 Islamic State, or IS, picked a Filipino rebel, who was recently killed, as its emir in Southeast Asia, the U.S.-based SITE Intelligence Group says. Some Indonesian sympathizers worked alongside Filipino rebels in a five-month war in the southern Philippines last year. "President Duterte said that he wants to intensify maritime security in cooperation with Indonesia as foreign and local terrorists continue to enter and exit the country despite the military efforts to go after these elements," the Philippine presidential office website said. Philippine officials suspected that Indonesians as well as Malaysians had reached the southern island Mindanao last year to support a battle being fought by local Islamic State-inspired rebels. That fighting killed at least 1,127 people, including more than 900 militants. In October, troops declared victory over the Maute Group of Muslim rebels, which had pledged allegiance to Islamic State, which is also referred to as ISIS. At least 38 Indonesians were helping the Philippine rebels as of June, a month after the battle broke out in the city of Marawi, a police spokesman told news outlets in Jakarta at the time. 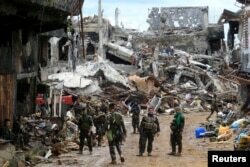 Damaged buildings are seen inside a war-torn area in Marawi City, southern Philippines October 24, 2017, after the Philippines announced on Monday the end of five months of military operations in a southern city held by pro-Islamic State rebels. Some of the 40 to 50 foreign rebel supporters in Marawi had traveled from Indonesia, "responding directly to the call of the ISIS," said Bibhu Routray, a visiting security and counter-terrorism professor at Murdoch University in Australia. Thirty Indonesians got there from Syria, apparently sent by IS, Routray said. "A lot of Indonesians had actually gone to Syria and on their way back to (their) home country they were routing through the Philippines, so that’s one direct evidence that ISIS probably had sent them back to fight in Marawi," he said. The Indonesian government said in November it would support the Philippine effort to stop radical elements in Marawi. In June the same government had sent 119 police officers and 200 special forces to Sulawesi Island to help the army squelch terrorists. Philippine officials have warned against new Muslim rebel violence in Mindanao even with Marawi under control. "I think it’s logical that Indonesia should always keep its guards up, because they know for a fact that their main sleeper cells around Indonesia are waiting for opportunities to come," said Eduardo Araral, associate professor at the National University of Singapore’s public policy school. Government soldiers stand in front of damaged houses and buildings in Marawi city, Philippines, Oct. 25, 2017. 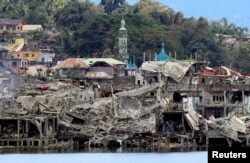 About 20 Muslim rebel groups operate in resource-rich but impoverished Mindanao, the southernmost major Philippine island and the site of Marawi. They believe the majority Catholic country has taken a lopsided share of resources despite five centuries of Muslim settlement. Rebel violence has left about 120,000 dead in Mindanao since the 1960s. IS "sleeper cells" operate in most Indonesian provinces, the Straits Times of Singapore has reported, referring to groups that can be called to action as needed. The radical Islamic group East Indonesia Mujaheedin, which recruits young people in the jungles of Sulawesi island, has pledged support to IS. "Despite the ending of the physical war in Marawi, the two countries remain vigilant because they know that there’s still a lot of risk and threats that have not been totally eliminated," Araral said. "The capability of ISIS and their affiliation in Southeast Asia to the group is still there," he said. "Financing is still flowing. The ideology is still there. They might have lost leaders, but I’m sure there will be new leaders that would come around." The presidential office did not spell out how Duterte and the Indonesian minister planned to control migration by suspected terrorists. 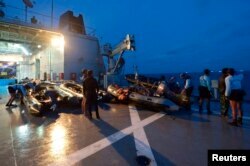 Analysts point to a chronic lack of patrols in the Celebes Sea, a 285,000 square-kilometer body of water bounded by Mindanao to the north, Borneo to the west and Sulawesi to the south. Ten years ago the sea was already a "serious maritime black spot," the Jamestown Foundation security research organization says in a study. FILE - Indonesian navy divers are seen on board their vessel preparing for an underwater mission in the Java Sea January 9, 2015. "Decades of poor governance, economic and political marginalization, lack of state capacity, and separatist conflict have turned this area into an ‘ungoverned space’ and hence a haven for transnational criminals, including terrorists," it says. The Philippine armed forces ran a poorly funded navy then, it adds. But Indonesia and the Philippines have overall strong ties plus a record for reaching maritime agreements. They signed an agreement in 2014 after two decades of talks on formal boundaries around their exclusive economic zones in the Celebes Sea – a deal aimed at improving resource cooperation. "There’s a lot of cross-border traffic there, and so that’s caused some problems, but as much as it’s caused some problems it’s also been the focus of some agreements that have been fairly promising in terms of maritime boundary delimitation," said Jonathan Spangler, director of the Taipei-based South China Sea Think Tank.